Part 3 is days 18 – 25 ( sort of 26 ). This is the FINAL post… finally! Wow! I didn’t realize how much of an effort it would be to recall the details of the trip and put them into a daily summary. Glad to have this done. Time to start focusing on future adventures, whether work or play (always try to make it feel like play of course). This post picks up after my first day of my stomach feeing better after 6 days of dealing with food poisoning symptoms. 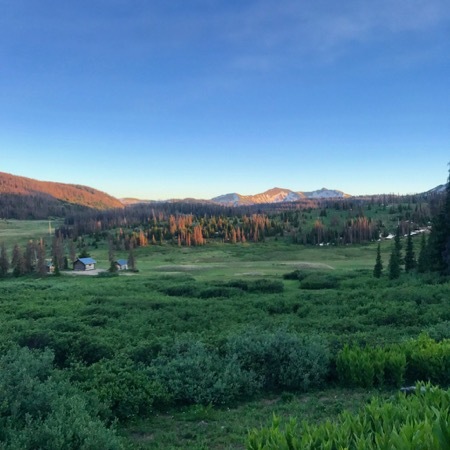 I had just spent the night in a hostel in Silverthorne after feasting on some Chipotle and Wendy’s frosties the night before… so spirits were high! Happy clicking. I woke up to my alarm that I set so I could get to the nearby coffee shop / bakery when they opened. I had a breakfast burrito, a bagel with cream cheese, and a scone. 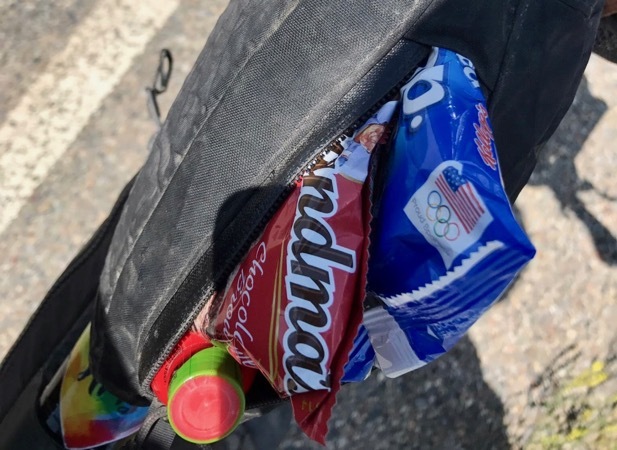 Of course, they had a whole rack of sweets so I stashed some goods in my frame bag for the road. 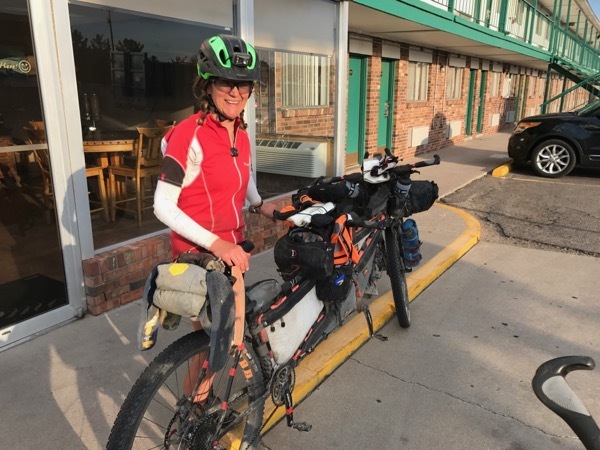 I made a quick stop just down the road at the Safeway in Dylan to resupply on bandaids, ibuprofen, and some batteries before pressing on to Breckenridge. I was rolling through the Breckenridge main street and ran into Jeff and Andrew. It was good to see them! They were just finishing breakfast and recommended I try the donuts from the shop they were just in. Of course, I had to get some, and I ordered a breakfast burrito to go for lunch down the road. I cruised off ahead of Andrew and Jeff, only to be passed up the road while redressing my hand. The big climb out of Breckenridge was a nice grade with excellent views. If only all climbs were this pleasant. After the pass, the terrain started to open up. Around midday I past the resupply in Hartsel; no need to resupply as I still had tons of food from Breckenridge and Silverthorne. 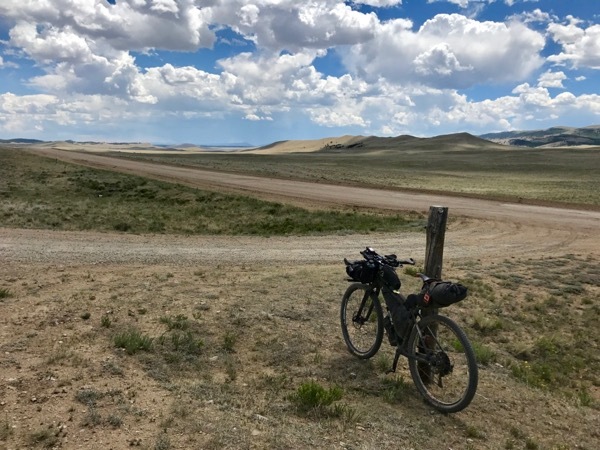 I ended up taking a short lunch break down the road before pushing on the rest of the day across bumpy washboard roads and into headwinds. Closer to Salida the terrain changed and became hilly once more. As the sun began to set, I reached the final climb before town. 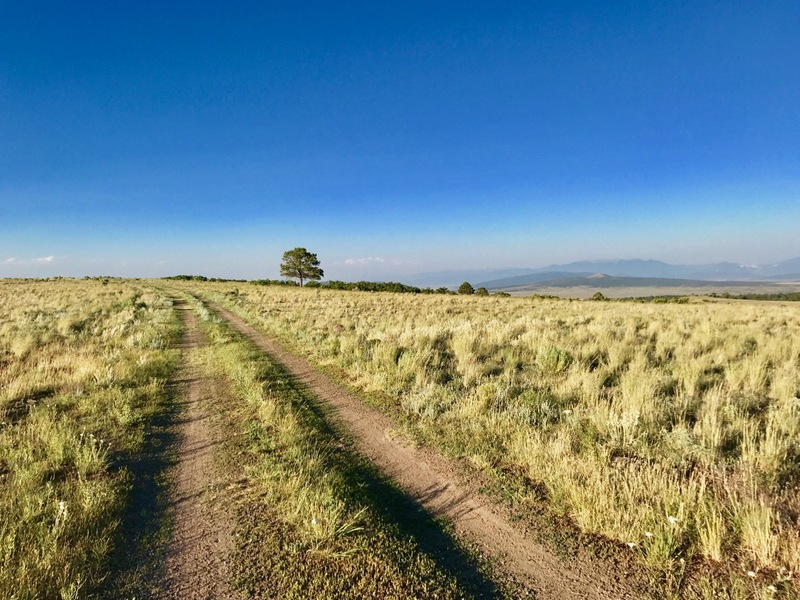 After navigating over the pass and through a herd of cows, I decided that I would camp just outside of town and ride in early in the morning. I found a perfect spot under a large tree 2 miles before town. Sometime in the night I remember waking to see Andrew and Jeff ride past (around midnight I believe). They likely didn't know I was there and I didn't bother shouting out to them as they rode by. I remember they were hoping to get into town much earlier in the day because Andrew needed to pick up a new saddle from the bike shop. His brooks saddle had a broken seat rail and he ordered one ahead of time to replace it. 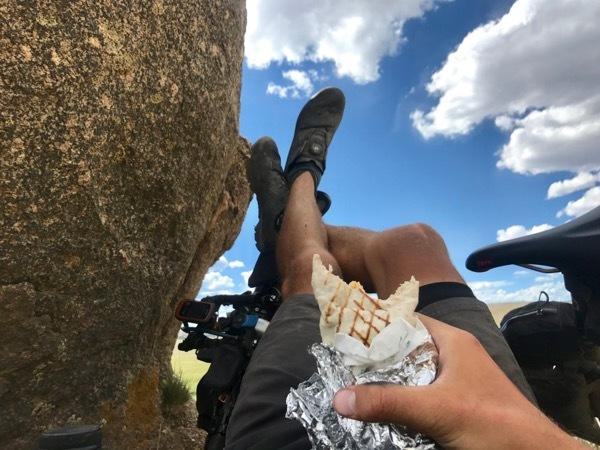 Enjoying my Breckenridge breakfast burrito in the only shade source in miles. I had woken up early to arrive at a cafe in town at open. They didn't have the full cafe open yet, but I still was able to order biscuits and gravy with sour dough toast! They had some good snacks for the road that I filled my bags with before heading out. Andrew and Jeff likely were going to have to hang out until the bike shop this morning, so I was going to have a big jump on them today. 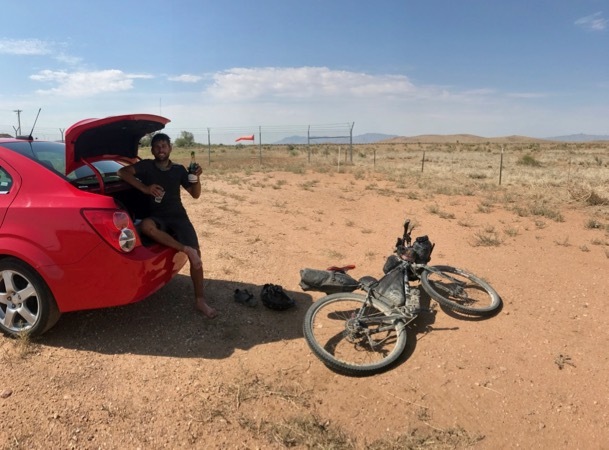 Scott, who I had met back at Brush Mountain Lodge was already on the road. Perhaps I'd catch him today. It was feeling like it might be a headwind day today. 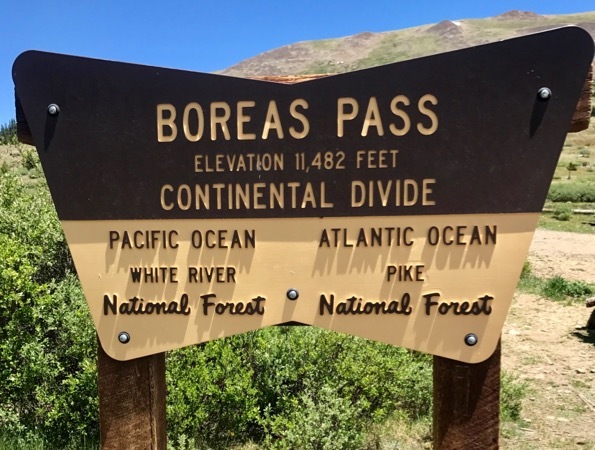 It felt like a slow grind to Poncha Spring, but things really slowed down once I turned to ride up the pass. My favorite thing, super strong headwinds while climbing. I cursed my way to the gravel turnoff, but once off the pavement the tree cover got thicker and the headwinds mostly disappeared. It was a long climb this morning, and somewhere towards the top I caught up with Scott. This time, he was the one dealing with stomach problems. We rode for a bit, but when some rain hit, I pushed ahead while he was fiddling with some rain gear deep in his bike bags. "See you down the road!" I said to Scott. This was my common farewell call to other riders when I was either being passed, or passing. It wasn't always true, but I was always surprised how many repeat run-ins I had in different sections of the race. On the backside of that pass was a small town with a gas station and restaurant in Sargents. I put in an order for a chili burger and fries and while that was cooking I resupplied in the gas station convenience store (same building). Scott came in about the time my food was delivered and we sat together for a bit. After I paid my bill, I'm sure I gave him my same farewell before heading out. The next segment was brutal. I was fairly flat pavement, but with stand and pedal headwinds. Even after turning off the pavement a couple hours down the road, the route still angled into the wind and uphill. I tried my best not to stop and push my pace. Everyone was going to be struggling out here and it was a good opportunity to push ahead if I stayed positive and pushed on. Plus I was closing the gap on the rider in front of me and wanted to try and catch him today. Later in the evening I took a short dinner break and elevated my legs. After Pop-Tarts and some other snacks I pushed on. 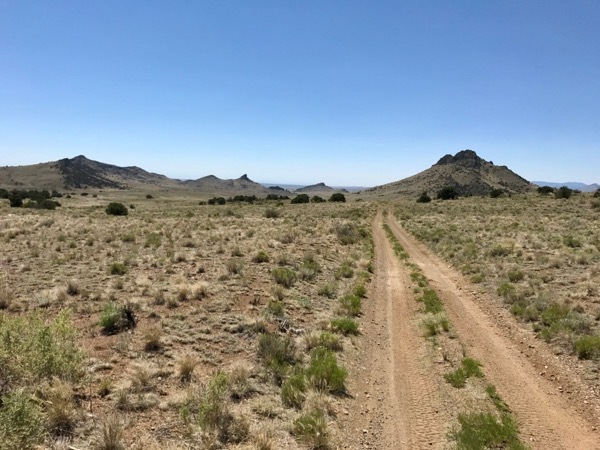 Del Norte was still a long ways away and I wanted to close the gap. 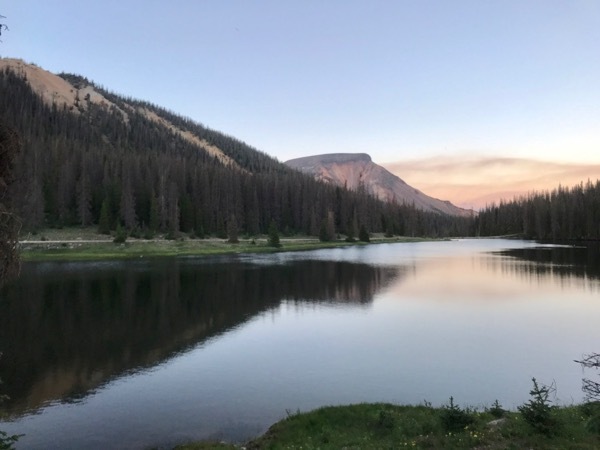 I ran across a CDT (Continental Divide Trail) hiker off trail trying to scout out some water. I was getting low myself and wasn't about to offer up mine (not that he asked)... I hope he found something better than the skunky cow pasture water. I finished a climb in the dark and remember riding to a pavement. I was getting sleepy, but thought about the rider ahead of me and decided it was worth pushing on for a while. I remembered seeing a tent with a light on to it about 5 minutes later. I was hoping it was the rider I had been tracking earlier that day! I'm pretty sure it was, because when I checked the next day I was ahead of him. 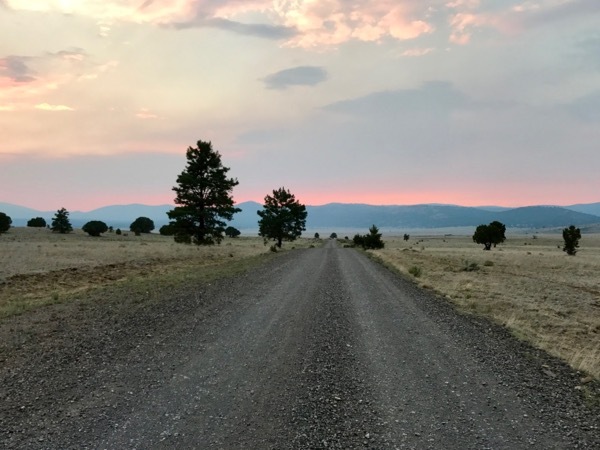 After turning onto gravel, I pushed into the Rio Grande National Forest before setting up my sleeping bag near a dry creek bed and dozing off. I don't remember the ride to Del Norte being all too eventful this morning. Just that it took me longer to get there than I was expecting. I rolled into town around noon. Eager to keep moving, I decided to try and make my stop short and grabbed lunch at Subway. Still, by the time I ate and resupplied it was a longer stop than I expected it would be. I had to stop on my way out of town today to stretch my hip. It had been tightening up the last couple days and I found myself having to stop a couple times a day to stretch it out. On the way out of town, the road turned to gravel and became a steep climb. If I wasn't careful about keeping my pedaling consistent, my rear tire would spin out. The climb continued all the way up to almost 12,000 ft, the highest pass of the entire route. 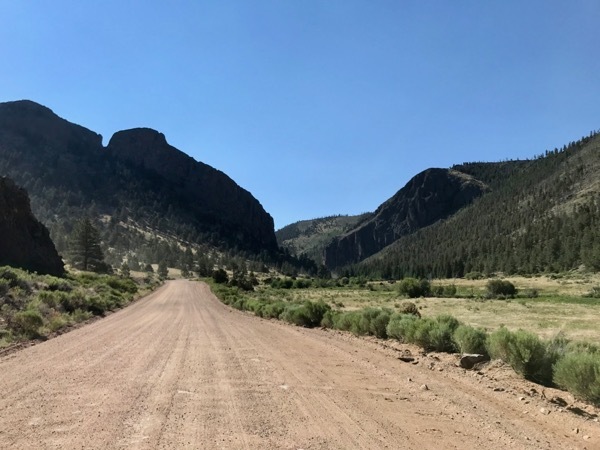 Up here was Summitville, which appeared to be an ghost mining town with some more modern mining operations still in place. 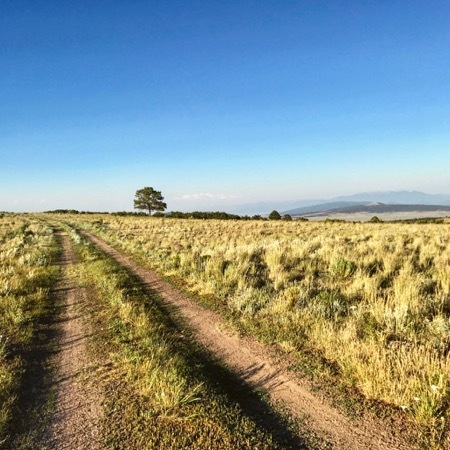 After the pass, the route descended and then continued to climb... hill repeats around 12k feet tested the body, but the views helped distract the mind. It was dark when I ended up descending all the way to Platoro. The lodge there was closed, so I decided I'd shoot for the small resupply down the road. I rode about half way there before calling it a night at a campground. The campground appeared to be empty. I picked the first site and put my sleeping bag up next to the picnic table. The night sky on most of this ride was one of my favorite parts about the trip. Every night I rode alone under an amazing night sky. Theres something incredible about feeling so small yet so alive riding with the Milky Way stretching across the sky. At night before passing out, I would try and catch a shooting star. Tonight I witnessed what appeared to be an explosion in the sky. It was the craziest thing... I couldn't make out what I saw. Was it a shooting star that I just saw from a unique angle? A supernova? Did a country blow up another countries satellite? Was I just sleep deprived and seeing things? My mind raced as I drifted asleep. My hip was tight already at the start of my ride this morning. I had to stretch a couple of times before arriving at the gift shop in Horca, Colorado. When I arrived, the shop was supposed to just have opened, but there were no signs of anyone there. If they didn't open I was really going to have to ration my food today. It was a long haul before any resupplies today. A local stopped to dropped something off and confirmed that they should be open. It was so nice to have a coffee and burrito on the porch. I ended up taking 4 of the smaller hand pies for the road. If I recall correctly, they said the order about 40 dozen boxes of them (each box containing a bunch of them) a week from an Amish community nearby. I also had a couple ice cream sandwiches on my way out the door! Calories! New Mexico was just down the road! I was excited to finally get there. I had one big road climb to get there, but once I did I celebrated by eating the first two hand pies. The strawberry rhubarb one blew my mind! 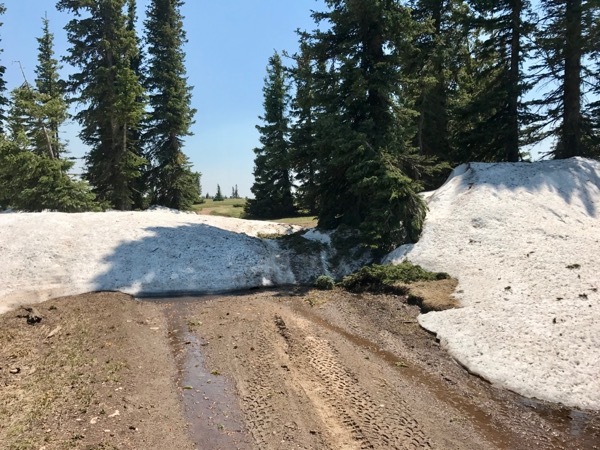 From there I continued to climb up past 11,000 feet and even found snow over the trail! Snow still in New Mexico! That was the last patch I would see. The rest of todays ride was hot and smokey. Sometime in the evening I reached the turn off for the reroute. There were fires that required the organizers to send riders on a different route. I later found out that those fires had been controlled, but they kept the reroute in place so that all riders rode the same route. 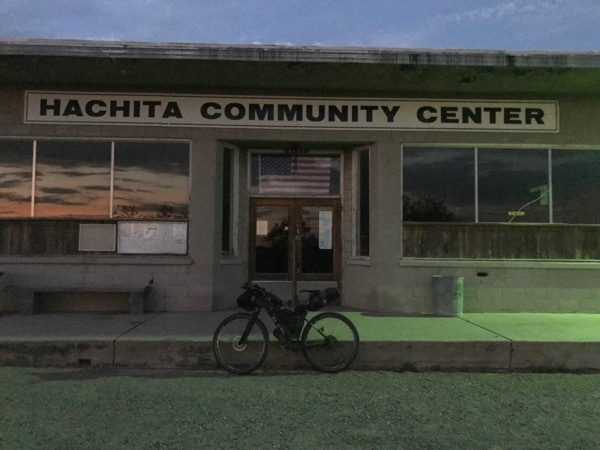 Once on the reroute, I descended out of the mountains near sunset and rode to Chili Line Depot in Petaca. I was hungry and hopeful that they were still open. The open sign was off, but the door was open. When I walked in they said they saw me coming on the tracker and hung around to see if I wanted something to eat. How awesome is that?! I made it worth there while and ordered a green chile burger and fries with a pint of a New Mexico IPA, a breakfast burrito to go (also green chiles) and two slices of pie (A la Mode) with an americano. I also grabbed some cookies, gatorade and snicker bars to go. Holy crap I love New Mexico food. Green chiles in everything and they are soooo delicious! That was probably the best burger I had on the entire route. The two people who stuck around were a mother and son and I had a great time chatting with them while they cooked and I stuffed my face. It was nice to have a moment to interact with locals along the route for more than a couple minutes. The decent out of the mountains and toward Petaca. 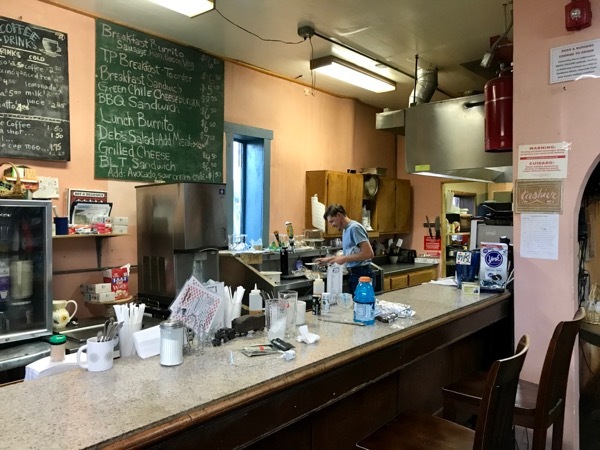 I hope to eat at Chili Line Depot again! After the amazing dinner and resupply, I rode for another couple hours. The riding was mostly pavement and a lot of downhill so I was able to put in some miles before bed. Tonights sleeping spot was a farm pasture - no cows in sight. I don't really recall any big holdup other than hanging out waiting for the gift shop to open and then hanging out for a while at dinner, so I don't really understand why the short mile day. Maybe a calculation error with the reroute. It was a quick ride to finish the reroute today since the alternate route was mostly pavement. When I hit the small "town" of Lamadera, the rest of the alternate route was uphill. 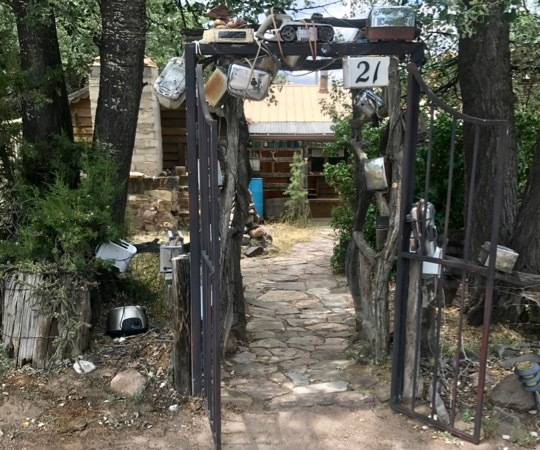 New Mexico towns were so quirky and unique. This state was growing on me fast. 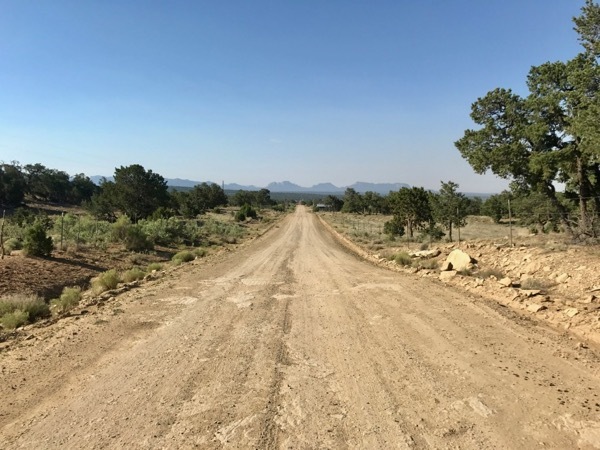 Back on the main route, it was gravel to the tiny town of El Rito and then paved to the first town with services today, Abiquiu. I got a large ice cream shake and a burger at the nice gas station in town. They had a hopping restaurant inside. The temperature was getting hot today and I had some serious climbing to do. I definitely took heading out again. 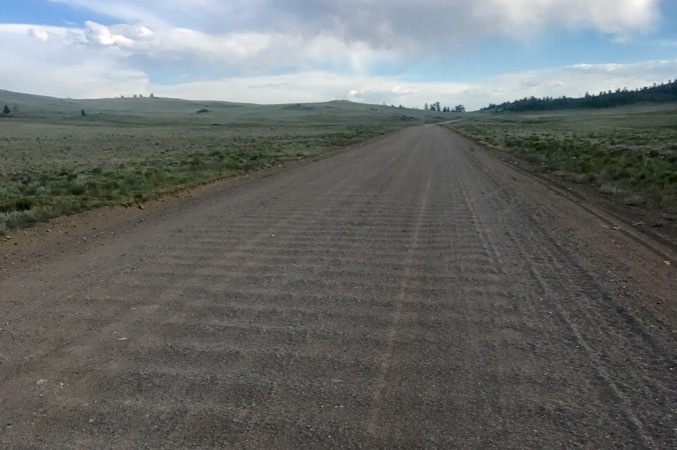 It was a steep gravel climb out of town and then turned into an interesting combination of smooth rock and dirt. It was a jeep trail that seemed to go on and on forever. Luckily my mind was kept busy picking the best line to climb from rock to rock. There were a couple hike-a-bike sections near the top. Somewhere after what appeared to be the top of the climb I took a break to eat some dinner (sugary snacks of course). From here the trail descended and climbed for the rest of the evening. 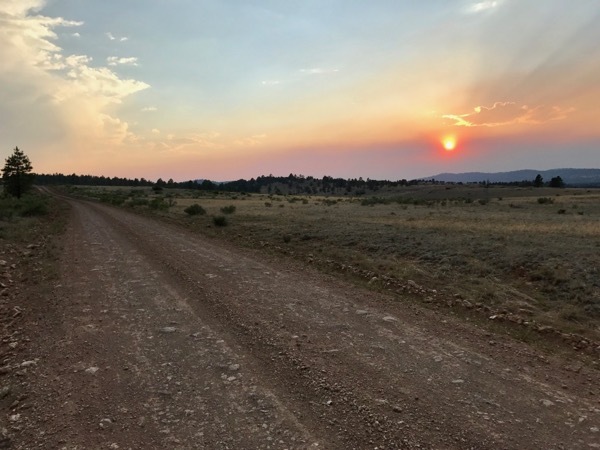 I ended up connecting with a less technical gravel road after dark. Dinner break. How do you like my natural sunscreen? I was pretty tired at this point, but not so tired to imagine what I saw next. A show of music and lights off in the woods. From a distance it looked like some sort of county fair with the rides lighting up the woods. Surely there wouldn't be a fair way out here... As I approached, I saw a familiar symbol on the turn off towards the strange event, the Burning Man symbol. If you aren't familiar, Burning Man is a huge art-like festival that occurs every year out in the Nevada desert. This must be some sort of small regional Burning Man festival. It would have been interesting to check out, but I figured that might not be a great idea at this hour. Maybe if I was touring I would have made the stop. I desperately wanted to finish the climbing segment that I was on and camp just short of Cuba tonight. The climbing seemed to never stop and at some point I had enough. I new I was close to the end of it, but wasn't willing to lose a lot of sleep over it. I think I setup my sleeping bag sometime after 11 PM. I ended up sleeping on a small flat area that jutted out just below the road. There weren't a lot of camping options on the twisty length of road I had been riding. Luckily I finished most of the climbing on the way to Cuba last night. It turned out that I stopped just short of a bunch of campgrounds, most of which were occupied. I only climbed a couple hundred feet before zipping downhill towards Cuba. Soon into the downhill I hit pavement and had a quick cruise into town where I stopped at a cafe for breakfast. Breakfast consisted of huevos rancheros, chips and salsa and pancakes. With my stomach satisfied, I went to the nearest gas station and resupplied for the day ahead. Finally, it was going to be a flatter day of riding. Once on the road, the temps got warm and the winds eventually changed in my favor. I was putting in some good miles. At this point I had settled into a position well ahead of the guys behind me, but couldn't seem to catch the rider ahead of me, Micah. I would be rolling into a town just as he was leaving, always leaving me an hour or two behind him. When I thought surely he was far ahead, I'd check and see that he was just up the road. I probably made some unnecessary stops this afternoon, but I knew it was a long exposed ride to Clarks where the next big resupply was. So, when there was a chance for grabbing a snack and a Gatorade, I took it. The first opportunity was a small service station not far out of town. It was hot so I was happy to slam a Gatorade and eat a banana... and have an ice cream sandwich. 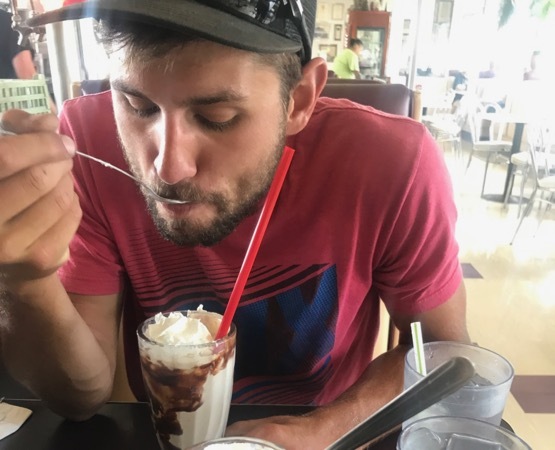 Get some electrolytes and calories while you can 🙂 The next opportunity was another 20 miles down the road at a laundromat. I basically did the same thing at this stop as well. 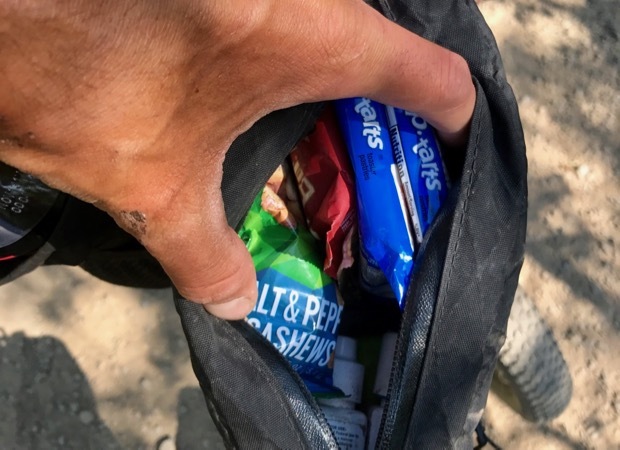 From there I was out of resupply options, so it was nice to know I hadn't dug into much of my packed food or hydration yet. Eventually I had to turn south and my nice tailwind turned into a cross wind. Storm clouds were mounting on both sides of me and it was starting to look like I was going to get very wet. I was actually looking forward to a shower, but it was the lightning that was striking the ground that was worrisome. There wasn't anywhere to hide, and rather than attempt to wait it out it looked like I might be able to escape if I got ahead of the storm. 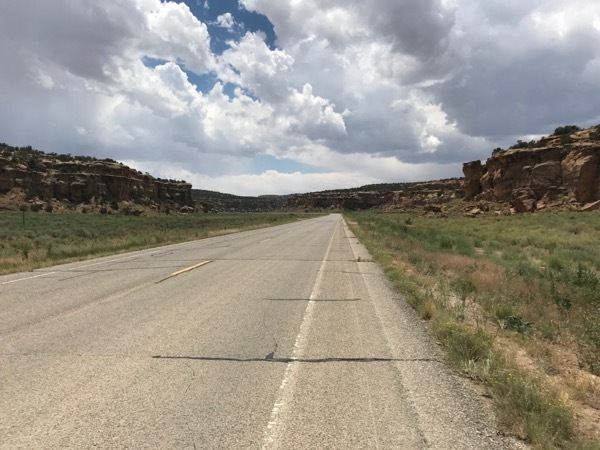 The moderate crosswinds became severe as the storm clouds neared and I was forced to stand and pedal with my bike at nearly a 45 degree angle to prevent getting blown off the road. After battling it out, I lucked out and narrowly pushed ahead of the storm. Flatter pavement riding was a nice change. Storms were starting to mount this afternoon. Delighted to have dodged some nasty thunderstorms this afternoon. Riding fuel. You know... healthy stuff. After jumping ahead of the weather, I was still fortunate to have clouds for the rest of the ride to Clarks. Most of todays ride was pavement and I made far better time than expected to Clarks. By 6:30 I was having dinner at none other than Subway. Despite not being a big fan of Subway, they are almost always located adjacent or even inside a gas station, so it was hard to pass up the convenience. I ate too much at dinner, because I was SO uncomfortable when I hit the road again. It wasn't until at least two hours later that I didn't feel like throwing up. I didn't realize it, but I didn't even eat dinner in Clarks... I stopped before town at a truck stop. There were a lot of good looking options, I kind of wished I had pedaled a little farther. Oh well. By the time I was out of town it was getting dark. 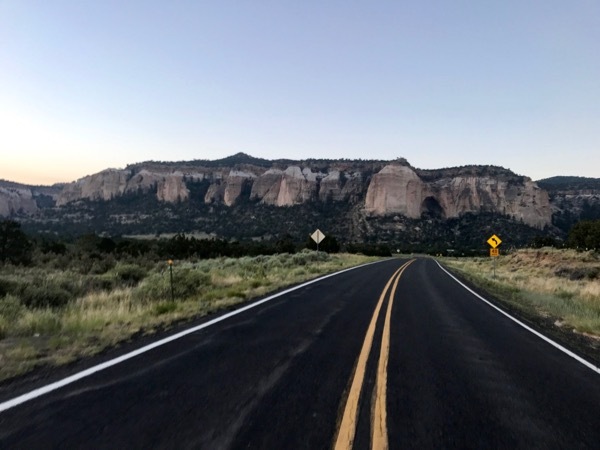 By dark I entered El Malpais National Monument. The El Malpais were very cool. Even though it was dark, the sky had cleared and the moon was bright. The moonlight was illuminating the large rock walls the lined the road through the park. I ended up calling it a night before getting through the park. I wanted to get closer to Pie Town tonight, but sleep was sounding pretty nice too. I wasn't winning any race this time around so I laid down at a turnoff behind some bushes. Pie Town today! 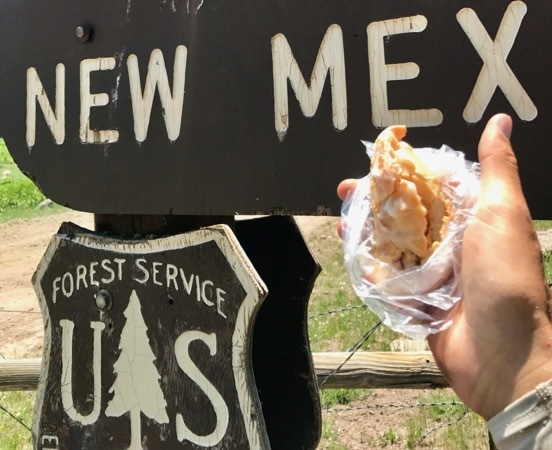 I was excited to finally check this town out and have me some pie! I still had about 40 miles to go this morning, less than half of which was in El Malpais. The rest of the riding was on dirt roads. When I got to Pie Town I was looking for a place called the Toaster House, a place Rob had told me was a great spot to take a rest at. I didn't really know what I was looking for, or how big Pie Town was, so I just started down the first street I came to. Sure enough, a block or two down the road I came across a house with about 30 toasters tied to the fence and hanging from the trees. I didn't literally think there were going to be toasters everywhere, but hey, the name makes sense now. Riding out of El Malpais this morning. Super cool rock cliffs! The road to Pie Town. That should be a movie title. 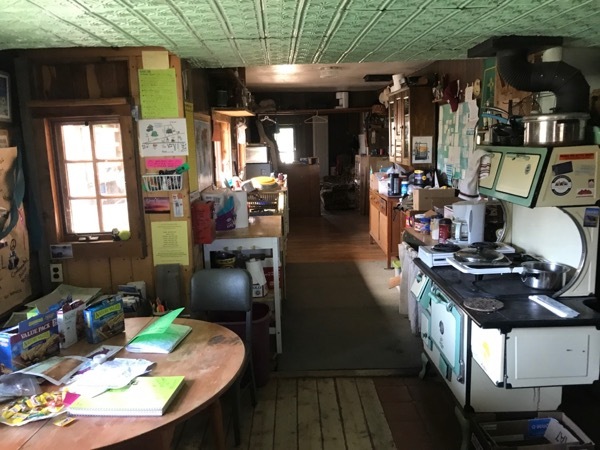 The Toaster House was a regular old residential house that a lady left open for Great Divide cyclists and CDT through-hikers to use on there way through town. 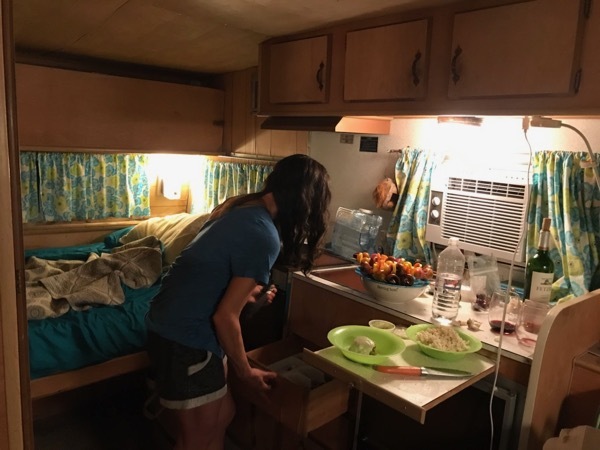 It was fully furnished with lots of sleeping arrangements and better yet a fridge out back full of soda, beer, and frozen pizzas. 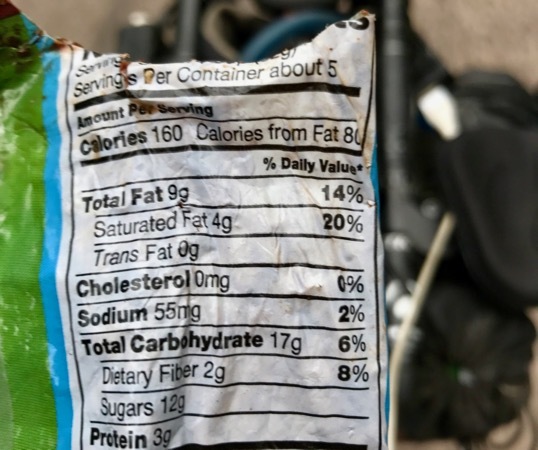 It even had boxes of various snacks and food organized by category that were left by other hikers/bikers. There was a donation box for people to donate what they felt was fair. I kicked back and had two sodas and cooked a pizza, while I was eating it I'm pretty sure I saw Micah ride by. He had rode all night and got to Pie Town sometime early in the morning. I wasn't going to chase him out the door... he was fresh after a solid chunk of sleep. 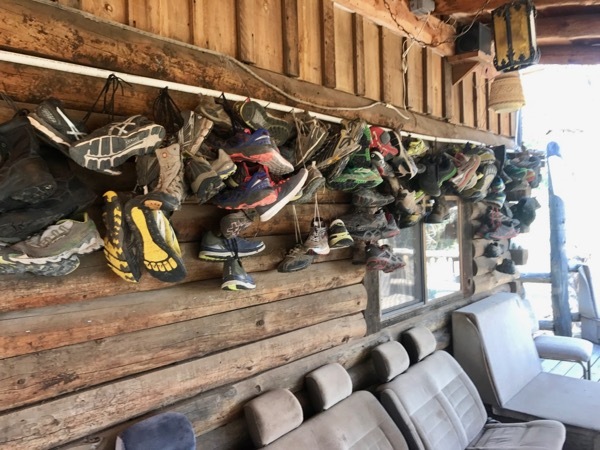 Shoe grave yard from CDT hikers. After I ate, I took a long overdue shower, grabbed some snacks for the road, and put in a donation for my enjoyable time at the Toaster House. It was time... time for PIE! I wasn't about to leave Pie Town without having some pie. Also, this next stretch was the longest of the trip without resupply, about 180 miles. Pie Town didn't have any stores but cafes with pie from what I could tell, so I was going to load up on calories before the next leg. 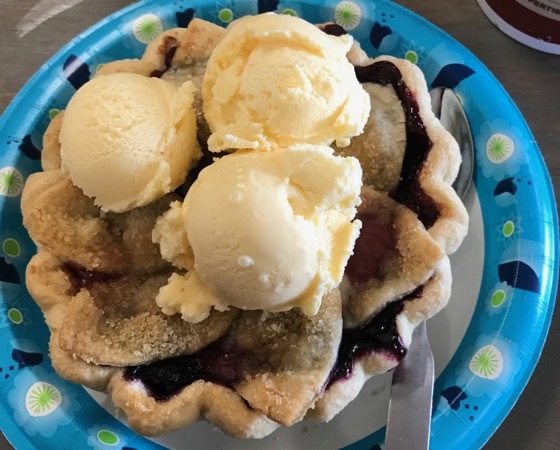 I ended up down the road at The Gathering where I had pulled pork and potato salad followed by my own triple berry 8" pie with ice cream. I had them make me 2 peanut butter and jelly sandwiches for the road. I was stuffed. So stuffed. 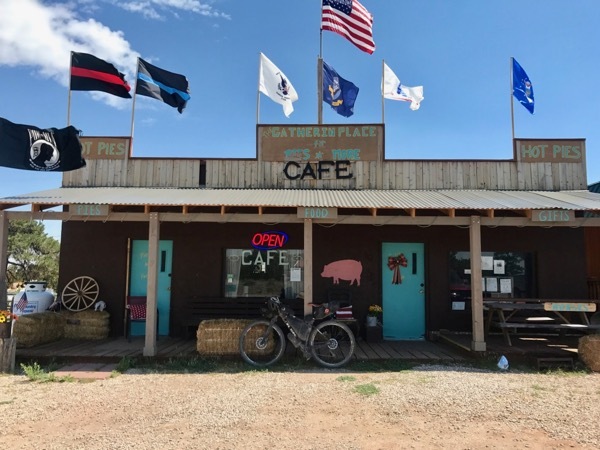 I wasn't looking forward to how uncomfortable I was going to feel riding, so I stopped and took a 20 minute nap at the Toaster House before heading out. At last! Pie in Pie Town! It was hot out today, but lucky for me some storm clouds were rolling in again. With storms came some strong headwinds, but they only lasted as the initial front passed. I saw some lightning and caught a little rain, but the clouds began to break as I moved on. After a little bit of climbing the route flattened out for the day, maybe even slightly down hill. 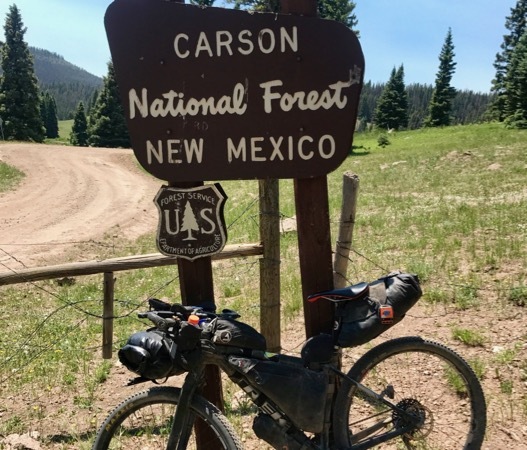 I was riding through Gila National Forest. That evening after the sun was low in the sky I saw some thunder clouds far off in the horizon. I couldn't tell which way they were going and I was worried that if they hit, the roads would become impassible. The roads were dirt and judging by the size of the ruts in the road at times, this was not a good road to be traveling on when wet. I made it my goal to make sure I rode out of this dirt road segment tonight. 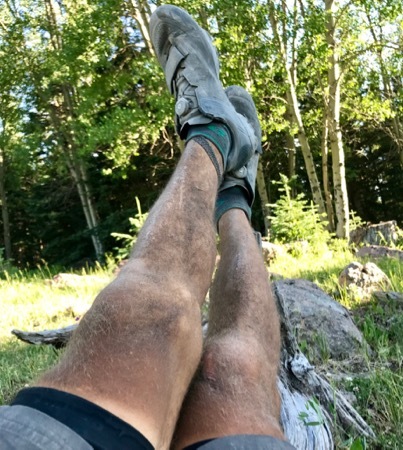 I think I rode until about 11 PM and set up my sleeping bag under a tall tree. The storm must have been traveling the opposite direction because I couldn't see its flashes in the distance anymore. The riding tonight had been pretty fast since it was mostly flat or downhill. I was sleepy and had been ready to stop riding for hours. I slept in until 6 AM today... I wasn't planning on it but I was so tired this morning. I told myself it was allowed because I wasn't planning on sleeping much tonight. 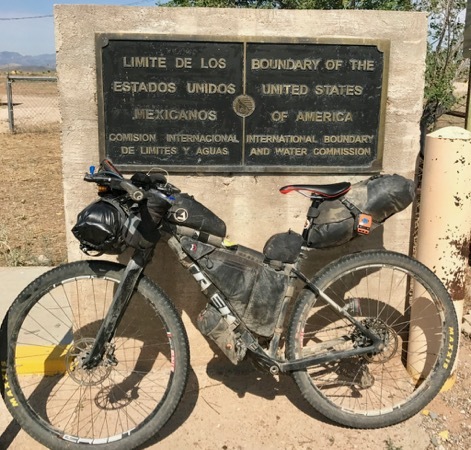 The border was under 2 days of riding away and I wanted to finish riding at a decent hour tomorrow. Carissa was going to meet me at the border and I as looking forward to kicking back and hanging for most of the day! Unfortunately most of the easy riding yesterday didn't carry forward to today. 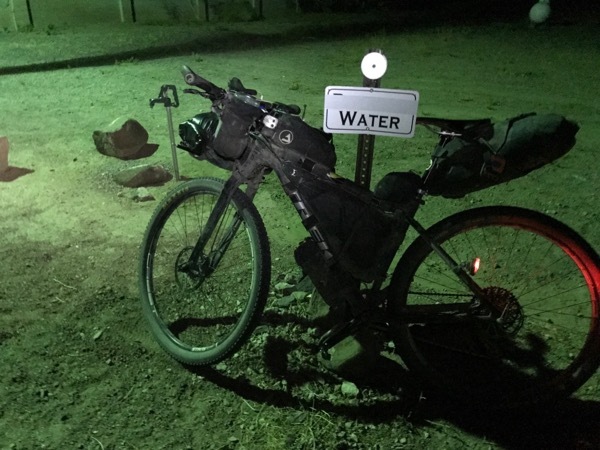 The uphill began shortly into todays ride, right after a much needed water refill at the Forest Service Work Center. Unfortunately, there wasn't much there but a water spigot. I was going to have to ration food again today on the ride to Silver City. Why didn't I find a way to pack a pie for the road!?!? The road to Silver City was a windy with a fair amount of climbing. In the afternoon the sun was getting really warm and I pulled of for lunch and to rest in the shade. 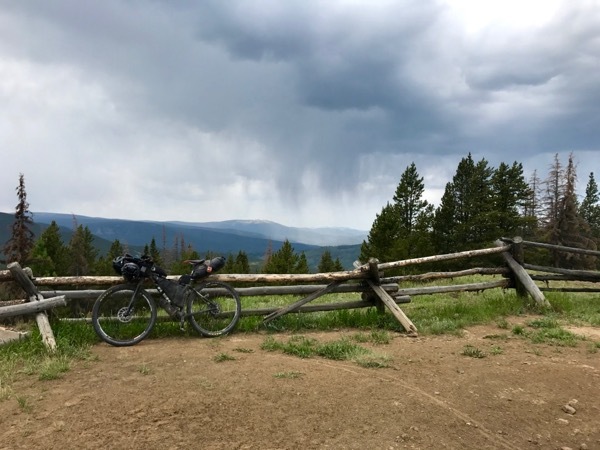 After a 15 minute snooze I woke up to rain clouds rolling in overhead and got a nice cool shower for the small pavement segment before the route joined the CDT (Continental Divide Trail). 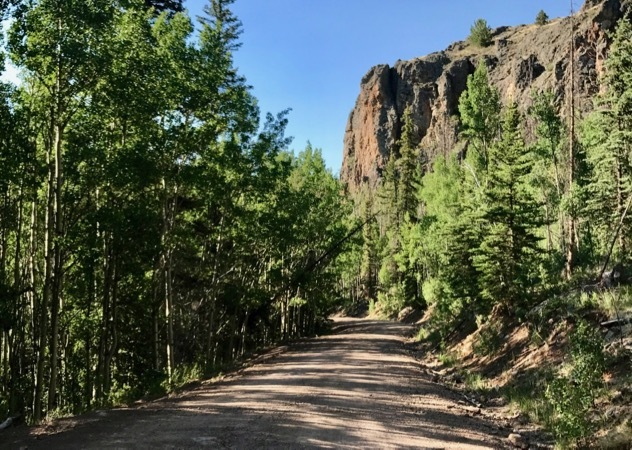 I'm not sure how many times the mountain bike route passes the CDT (hiking trail), but this is the first I really recognized. It was quite obvious because it was unrideable and I got a chance to be a hiker myself. I was glad to have cloud cover for this section because it was hard work! 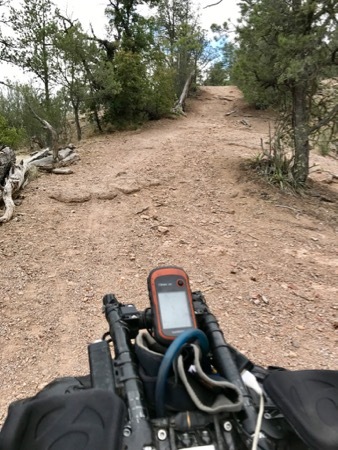 Even the rideable singletrack was technical and a little bit dangerous with the steep hills that they rode along. Also, I was getting really hungry at this point. I had eaten all my food except for a bag of granola. I had saved it as a reserve, but when I pulled it out of my bag I was kicking myself over having saved it. It was loaded with chocolate and had over 1000 calories. What was I doing saving this thing?? I could have been using the calories hours ago. I feasted on it... oh what a splendid moment that was. 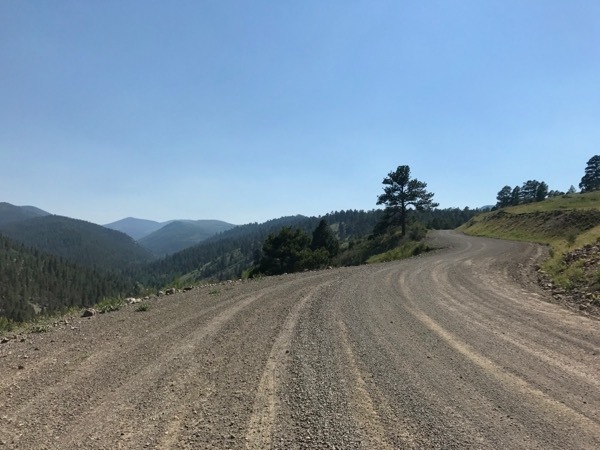 The single track climbed on for quite a while before and turned into a service road before finally dumping out to the road to Pinos Altos. There wasn't anything but a fancy supper club in town. As dirty as I was I wasn't going to set foot in there. Plus it wasn't far to Silver City so I pushed on. The hiking begins So many delicious calories! Whyyyy didn't I eat them earlier in the day??? When I rolled into Silver City I pulled out my phone to find some dining options. Dairy Queen was just down the road and ice cream sounded fantastic. On my way there, I saw the tandem couple that I hung out with at the hostel in Banff! I couldn't believe it! I guess that's who "Murtle the Turtle" was on trackleaders. They were surprised to see me as well and figured I would have finished by now. We traded some stories for a bit and I told them good luck on the last leg. 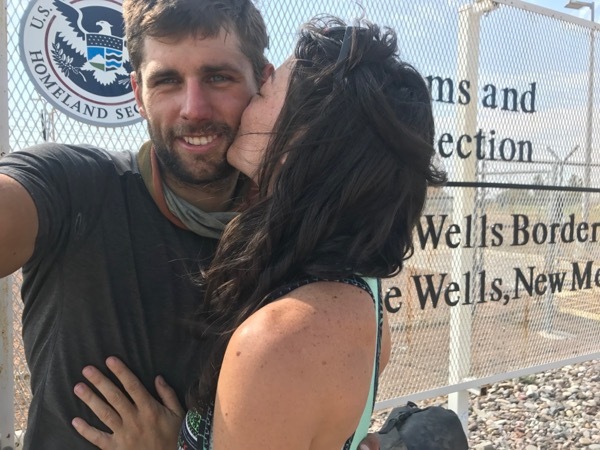 They were getting a hotel for the night and finishing the ride tomorrow. I told them I was going to see how far I could get tonight. Impressed by this couple! I couldn't imagine doing this ride on a tandem. After a well deserved blizzard and burger with fries, I sought out a convenience store for my final resupply. Right about then Rickie and Lee shouted out at me from a car. They were the two ladies I met all the way back in Lima, MT. They had finished a couple days back and were thoroughly enjoying themselves in Silver City. We chatted quick and they waved me off. I loaded up on all sorts of sugary snacks, 5 hour energy, and drank a coffee before rolling out of town. I wasn't going to be hungry or caffeine deficient on this last leg! Rolling out of town around 9 PM, I was delighted to find a good tailwind. I was feeling good. Micah was about 30 miles down the road... he was stopped. My fingers were crossed that he was calling it a night. I was going to push hard to catch him. Unfortunately around 10:30 PM or so I saw his dot start moving again, I was sure he was going to shoot for the border tonight. I wouldn't catch him. Was fun trying to catch him the last couple days! Still the riding tonight was great. I found myself cruising on dirt roads to the town of White Signal. From there it was pavement pavement to the border. I was glad to be riding at night, because even then the air felt warm and I was sweating a little. I rolled into Hatchita around 3:30 AM. Carissa had a 4 hour drive to the border still and I had about a 5 hour ride. She was planning to leave around 6 AM, but told me to call if she should leave earlier. I didn't have service, so I figured an hour and a half nap would put us on the same schedule. There wasn't any benefit of pushing on at this point; Micah was almost to the border. 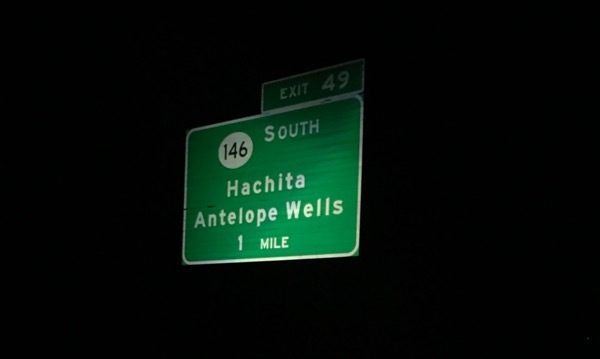 First sign of Antelope Wells! So, just to make sure I didn't get to comfy, I just laid on the ground with my puffy on. I was out like a light. The only service open in Hatchita when I passed through. Breakfast stoop. I ate my morning Pop-Tarts and watched the pre-sunrise sky for a bit before pedaling on. I found some service just down the road and gave Carissa a call. She was just getting up and getting ready to head out. It was crazy to think I was only 4 hours from the end! Mexico Border here I come! 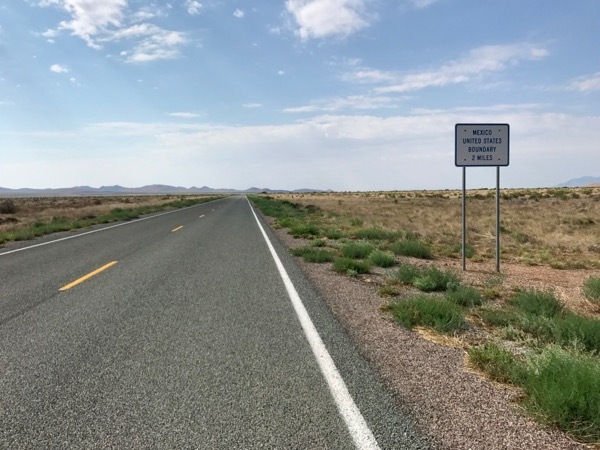 It was a nice flat stretch to Antelope Wells. Unfortunately I had lost my tailwind from last night and was catching a headwind instead. I felt slow and the last 15 miles seemed to tick by slower than any of the other 2700 miles. 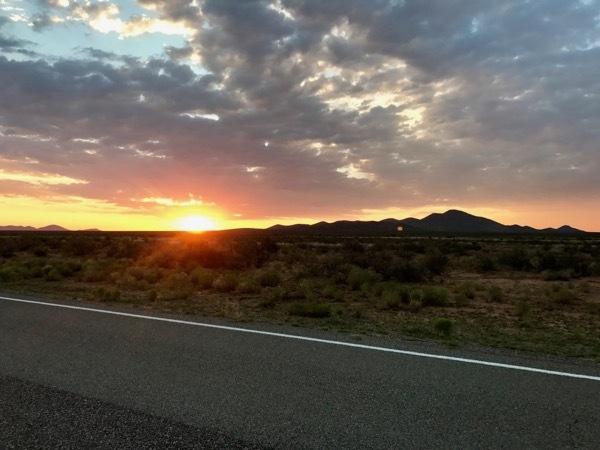 As I neared the border, I could see Carissa standing there with the rental car. It was a surreal moment. The end of a long pedal with a long awaited reunion. A whirlwind of emotions and I still struggled to grasp that this was the end. Hopping off my bike for the last time I was greeted with a great big hug - it was great to see Carissa, I was really glad she came to the finish to see me. 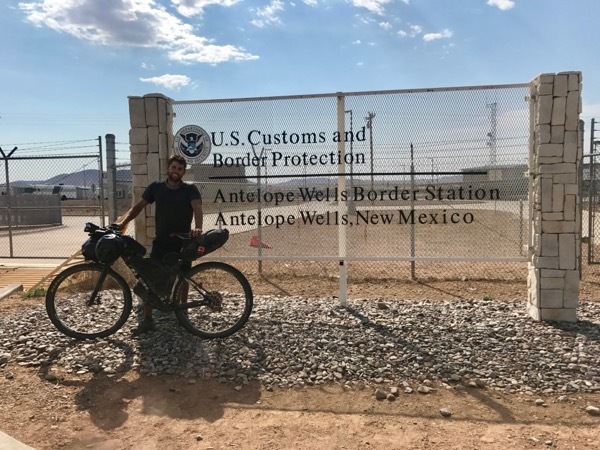 I walked my bike to the border sign for some photos. It was a crazy feeling, knowing you were done pedaling and had just reached the end. It was so different than other races, the ones with finish lines and crowds. Typical races you are 100% depleted when you cross the finish line because you've just pushed a ridiculous pace for 2 to 4 hours and are done. 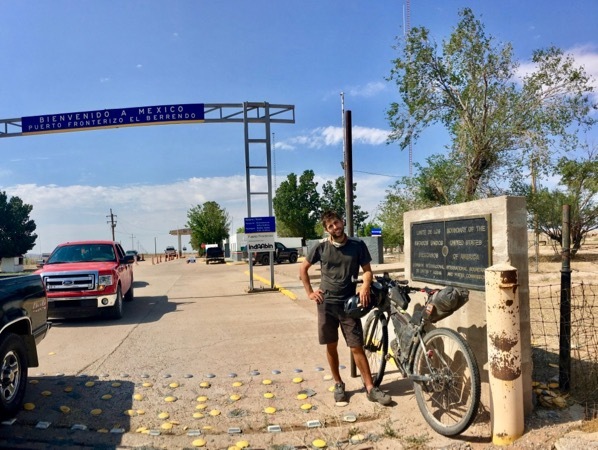 This was different, sure I was exhausted, but I had been tired and exhausted for 25 days, so hopping off my bike at the border felt the same physically as hopping off my bike the last 100 times I did it. 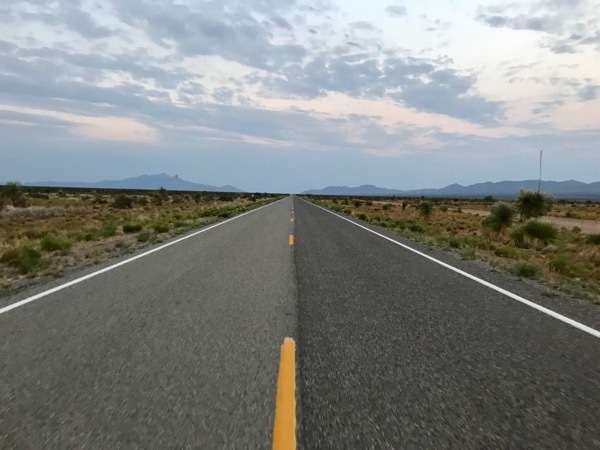 I had heard I should try to reach the actual Mexico border and Carissa went and talked to the border guard to see if we could walk to it. He pointed us where to go and I to stand on the physical line where the two countries met. Much cooler! Afterwards Carissa popped champagne and we hung out in the shade of the open trunk catching up while I ate a bunch of delicious snacks she had brung along. There was an ice cold IPA in the cooler as well! A great finish to a great adventure. Bubbly time! I'm spoiled 🙂 Oh how I've missed my Chacos. No more foot prisons! 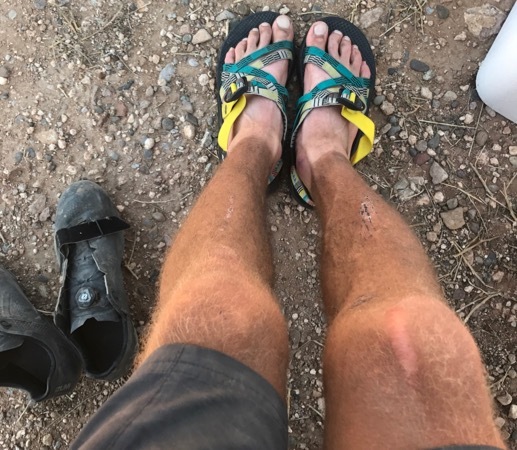 Lot's of work to get rid of these tan lines. 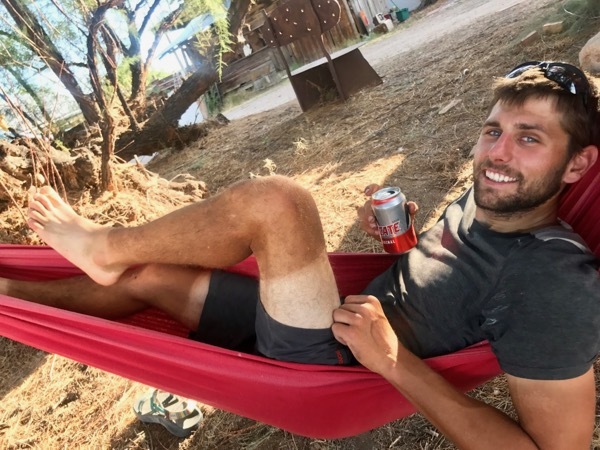 How's that for tan lines? I did a lot of this over the next few days. The spacious trailer in Albuquerque. Much bigger than the van! That’s it folks! Not as many unique human interactions to recount as my touring posts. Racing doesn’t afford much time to explore the environments I was riding through either, most of my pictures were taken on the fly. 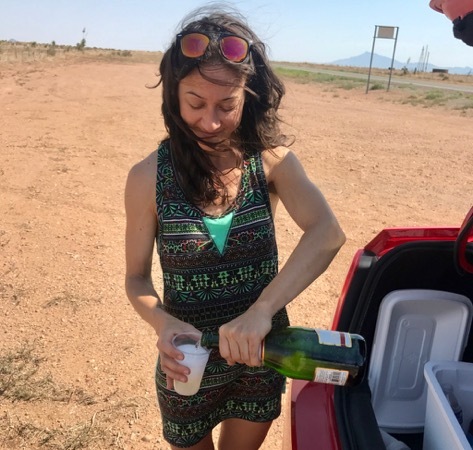 I enjoy writing about touring more… I feel like I’m just complaining when I recount the difficulties of a race. Racing is a different beast. Not nearly as FUN as touring, but still a deeply satisfying challenge which is addictive and fun in it’s own way. I’ll probably give this race another shot in the future – I’d like to put in a ride with fewer complications. 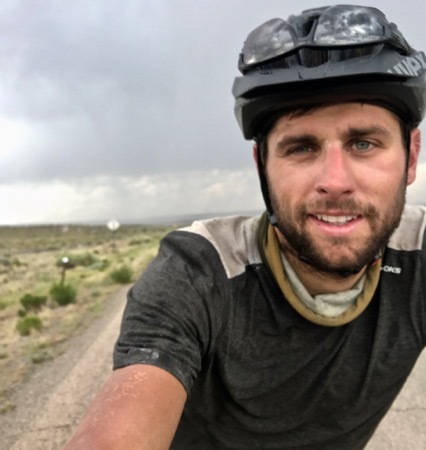 If nothing else, I’m definitely interested in attempting more 400 to 500 mile bikepacking races, where it’s easier to fathom how much suffering is left in the race. Until the next big event, I’m planning to make weekend bike trips a frequent thing. Even in training, I really enjoyed short trips out of the Tahoe basin and exploring all sorts of new areas. It would be nice to do the same, but with company and some more pleasures such as a stove, coffee, playing cards, and a beer. I hope all your summers are going great! Some of the best riding is still ahead of us! Congratulations once again Brad! We really enjoyed following you in the race even though there were a lot of anxious moments. Loved looking at all your pictures and hearing the tales of the trail. 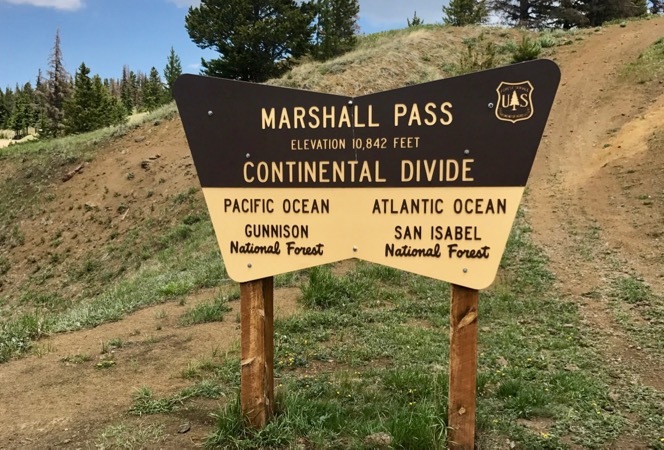 2,700 miles of up and down mountain passes and desert plains… incredible. Well done Brad, Well done!!! Looking forward to seeing you in August! Thanks Dad! Looking forward to being home for a while! Thanks for all the support along the way. What an experience. Not for the faint of heart! You really have to have stamina and drive to keep going when the going gets tough. I’m through whining when I have mulch to haul and it’s 90. See you in August. Ha! Oh Grandma don’t be so modest! You are an inspiration for me too… I can only hope to be as strong and active as you when I’m older! Yesss can’t wait to see you in a few weeks! Thanks Lou! 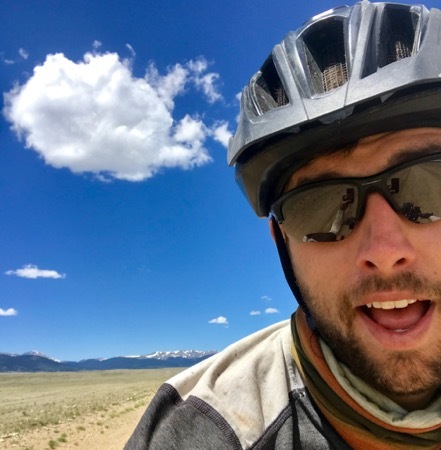 C’mon out and ride some Tahoe Rim Trail sometime!